Grout is a paste made when grouting powder is mixed with water. It is used to seal the gap between all the tesserae and smoothen the overall image of the mosaic giving it an unbroken surface whilst strengthening the bond between the tiles. While the glue holds the tesserae down from the base, the grout will firmly lock the tesserae in from the sides. 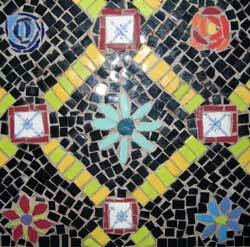 Grout keeps out the weather and dirt and will protect the mosaic from vandals or breakage. 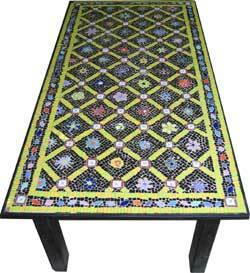 It can also enhance or tone down the mosaic depending on color. Grout can be used for practical and aesthetic reasons. It can be washed down to remove any dust, dirt, spills, food or other materials. Grout is available in ready mixed form or powder to be mixed with water when desired. I recommend that you think about what type of grout you want to use early in the mosaic planning process. If you are grouting a floor based mosaic remember to choose a grout that will survive people, dogs, prams, bikes going over it. For this reason I would not advise any light colored grouts or white. Brown, grey and the darker colors are probably more suitable. Grout generally comes in white, grey, beige and brown, however other colors can be mixed using color powder or liquid grout colorant. If you are mixing color powder you mix it with the grout powder before adding water, if you are using liquid color then you should mix the color into the grout after the water has been stirred through. Be very wary that color changes as the grout dries and if you are unsure as to the effect a certain amount of color will have then it is always a good idea to do a little trial and mix it up and let it dry before putting it with your tesserae. Grey grout provides and excellent neutral frame which will enhance most colored tesserae and will have the most unifying effect out of all the color grouts as it treats black and white equally. White grout complements lighter tones so is very good for showing off pale mosaics, when used with bright and strong colors like Aztec blue and red you get a Mediterranean feel. Dark grout obviously unifies darker colored tesserae and segregate lighter ones. Be very careful when using colored grout however it can have a drastically wrong effect if used incorrectly! Read more about how to grout tile.